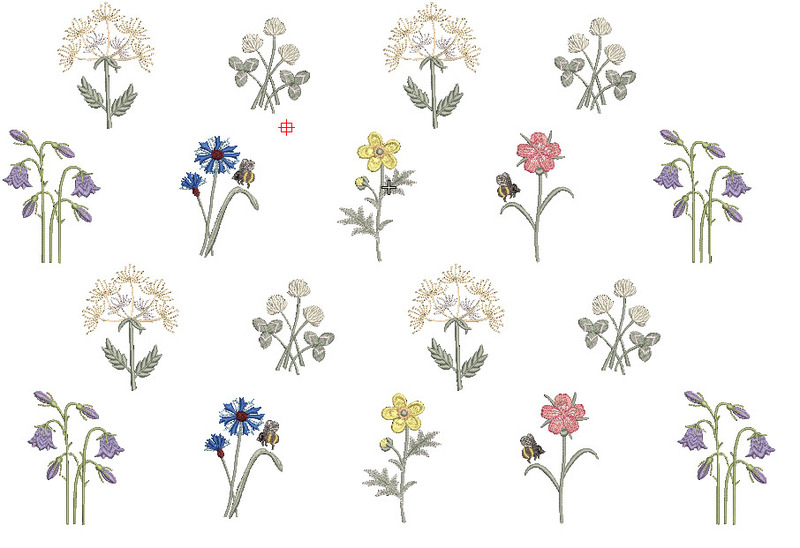 As I began the collection, digitising each flower I had it in mind to arrange them all in rows which I have done, but a little variety adds new possibilities. 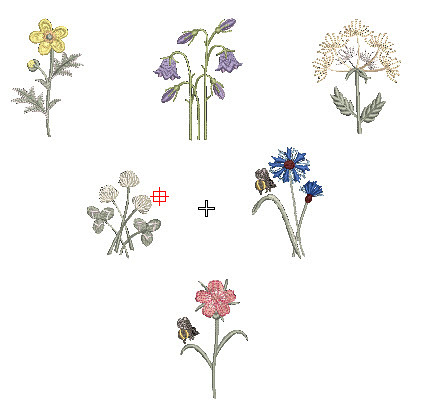 Many of the groupings in set 2 to 4 have an option of a silhouette background, which connects the flowers together and gives a hint of their habitat. I prefer these running stitches at the beginning of these designs to be a slightly darker shade than the fabric, rather than a darker grey, brown or green. However that is just my preference. It was while grouping just the harebells that I introduced a slope to the background, as I remember first seeing these on the chalk hills outside Winchester. Flowers never grow in perfect rows not even in the garden so I have experimented with various combinations. Although these will look great embroidered around a skirt hem the effect will be much improved with some undulations. 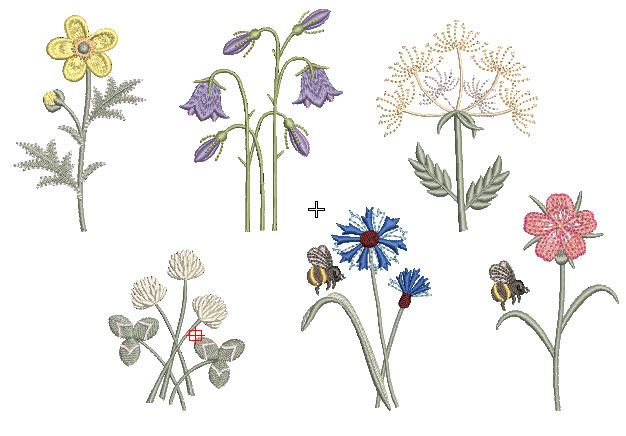 As well as the groups of mixed flowers, the second set of designs, for 5″ by 7″ hoops, has groups of just cornflowers, corn cockles, buttercups, harebells, clovers and cow parsley. 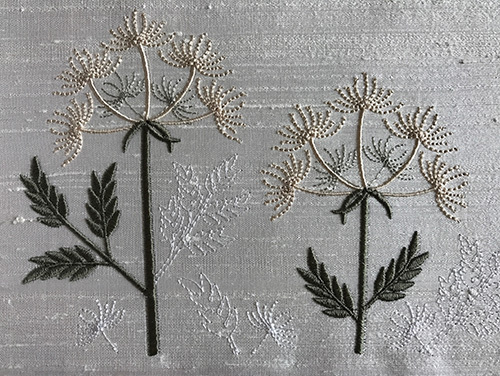 I also took a long time to create some borders and a corner for the collections and these developed nicely using the stems and leaves from the cow parsley designs. 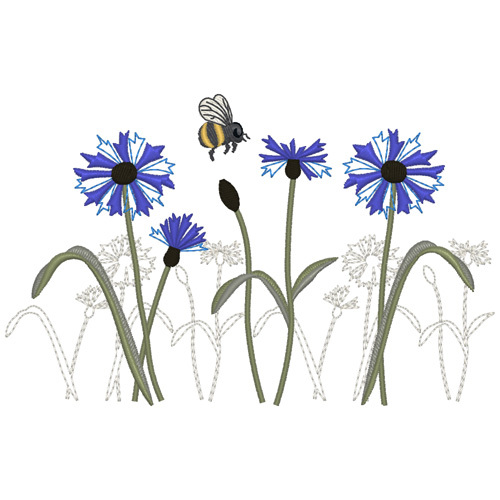 As I digitise I am always attempting to imagine what you will create with the designs, so I try to add as much variety and shape to the designs within a collection. There is nothing worse than finding that you do not have the right shape of design for your project. Hopefully the small designs that comprise the 4″ by 4″ set will give you enough scope to create larger designs in your software. 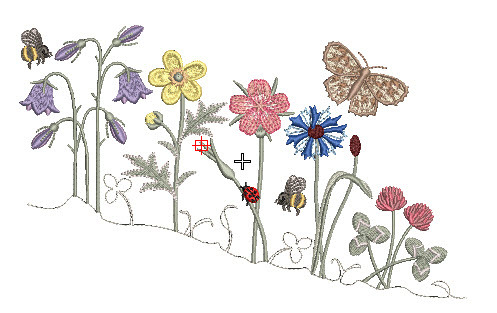 So I imagined a wild flower meadow quilt and created the panels and borders that would be required for that. The second set has 25 designs and has now been released and I am currently working on the designs for the large hoop. Today I created this sloping design and it can be mirror imaged like this. Here you see six different flowers from the collection, in a row equally spaced. The first thing I notice is that the pink clovers and corn cockles are next to each other. Now I have tried embroidering the clovers in just one colour, Sulky Rayon 1086, the palest of greens so that change would give some balance. Adding a row of clovers below as “ground” cover. Another formation for all over embroidered fabric? or place a border below or above. 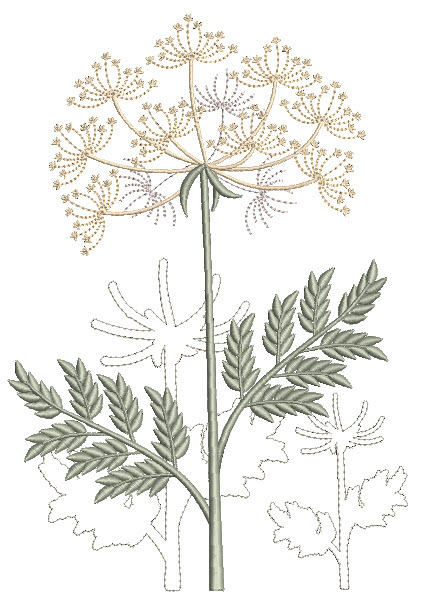 The third set for large hoops will be released after Easter and includes this majestic Cow parsley. It is all just beginning to come into flower now here in southern England and I am delighted that I have finally captured its beauty in stitches. Hope you like the silhouettes. 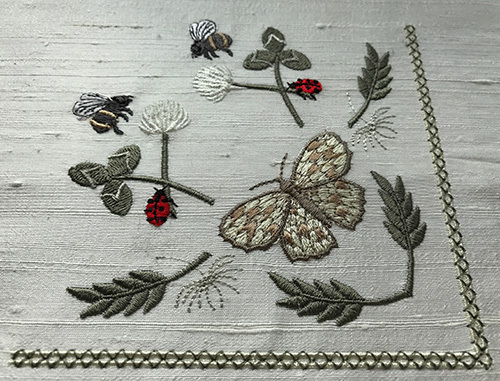 This entry was posted in Discussing machine embroidery, Embroidery projects, New Designs and tagged colour changes, combining embroidery designs, editing designs, machine embroidery, Placement of designs. Bookmark the permalink. These are just beautiful. Each new set out does the last. Don’t know how you do this, but please do not stop. Thank you. I am so enjoying creating these. A I plan my next embroidery adventure with Hazel, I am noticing that the color palette for this collection is new, at least for me. 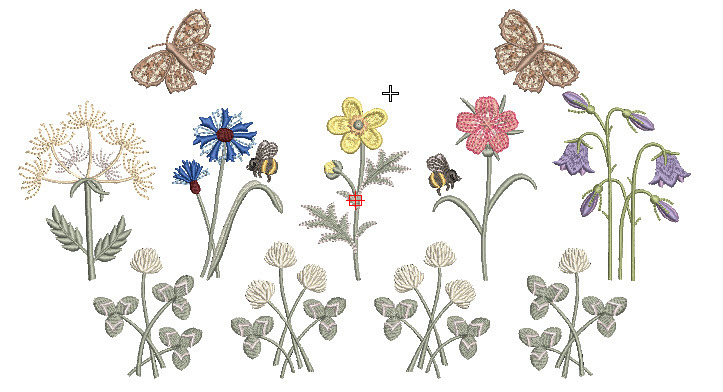 Hazel has truly captured the bright, colorful ambiance of a garden and transferred it to machine embroidery. 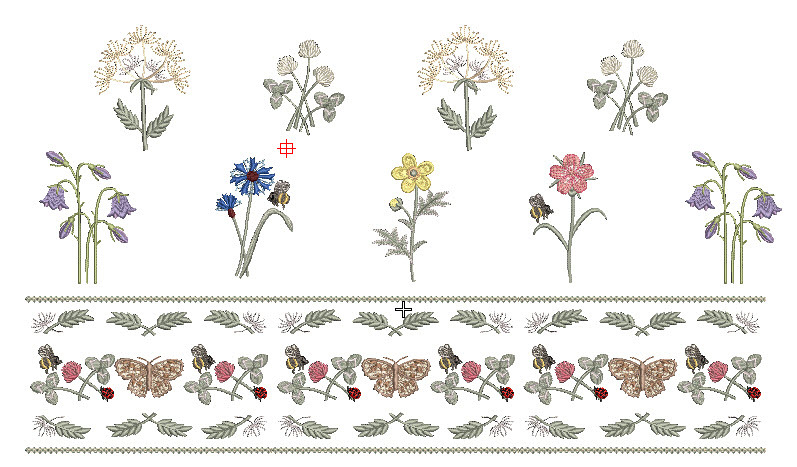 Presently, I am sewing a summer frock that will have this lovely flower garden embroidered around the skirt. That sounds just what I had in mind when I digitised these designs. 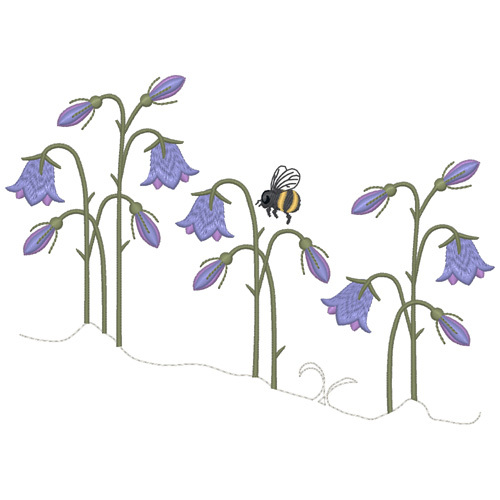 Please let me see some photos of your embroidery planting.